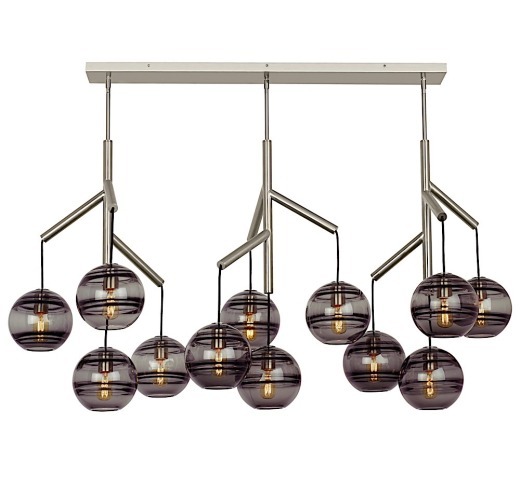 The Sedona Triple Chandelier offers a beautiful statement piece to add to your home. Each branch of the chandelier features four glass orbs from a branchlike central hub. Transparent glass orb is perfectly spherical and smooth on the exterior surface, the interior surface features gradually thickening bands of glass which are artfully crafted by talented artisans to add alluring visual interest and dimension to your space. It is available in aged brass or satin nickel finish and clear or smoke glass. If you would like aged brass with smoke glass or satin nickel with transparent glass, please contact us. Incandescent version is rated for up to (12) 60 watt max E26 medium based lamp (Lamp Not Included). LED includes (12) 3.5 watt, 300 delivered lumens 2700K, medium base LED vintage radio lamp.